Print your logo onto these custom printed globe light bulb stress balls or one of our other innovative building stress balls and use them in your next marketing campaign as a unique giveaway item. These promotional Light Bulb Stress Balls have your logo printed on them and are great for various campaigns, from "Bright Spark" to Electrical Saving campaigns, this handy tension-relieving stress ball strikes gold. 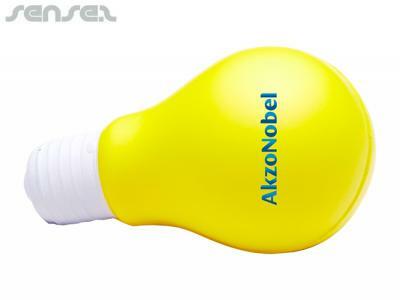 Promotional Light Bulb Stress Balls are a fun and unique way to reach your audience. These promotional giveaways are great quality, and will leave a long lasting impression of your superior brand in the minds and hearts of your valued customers. Full Colour Print: 35mm w x 30mm h - extra $0.80c per item. Custom brand these building block stress balls or one of our best-selling promotional stress balls»building stress balls with your company logo! Personalise your globe light bulb stress balls or custom design building stress balls for your marketing campaign. How can these unique promotional globe light bulb stress balls or our personalised building stress balls fit in with your marketing strategy and help you maximise your brand exposure? Our custom made Globe Light Bulb Stress Balls can be produced from a minimum quantity of 250 pieces. We can have your logo branded on these corporate Globe Light Bulb Stress Balls in Full Colour Digital Print or 1 Colour Pad Print. A setup fee of AU$120.00 will apply to make the film.